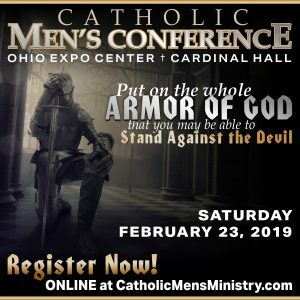 Just after St. Valentine’s day and just before the start of Lent, the 2019 Women’s and Men’s Columbus Catholic Conferences will be held at Kasich Hall (formerly Cardinal Hall) at the Ohio Expo Center. The conference dates are February 16 for the women’s and February 23 for the men’s. Both will offer an opportunity to hear inspiring speakers, confession, Mass, Adoration, and more. Save the date and pre- register now! Buy a ticket for a friend, religious ed teacher, sister, brother, or spouse and treat them to an inspiring and uplifting day as a thoughtful Christmas gift. Early bird tickets are $35 for regular and $20 for discounted student tickets. Religious are always free. Early bird ticket prices are good until January 14, 2019. After January 14 prices are $45 and $30. Women’s tickets are easily transferable. If something comes up, you’ll be able to pass them along to the person you think could use a bit of uplifting. Fr. Christopher Hartley, Colleen Mitchell, Sisters of Life Sr. Faustina Maria Pia, S.V., an update from Magnus MacFarlane-Barrow, Music from Out of Darkness, and Anna Mitchell as our Master of Ceremonies. Ladies, encourage your men to be a part of the 2019 Men’s Conference! What are the timings for the women’s conference on Feb16? The Conference starts at 8 am with Mass and end at 4:30 p.m. Hope to see you there! God bless. Very much looking forward to this event. This will be at least the 4th in a row. The conference only gets better each year. Well worth the time and effort to set aside the entire day for personal spiritual growth. Great speakers are on the agenda. Thank you for always providing for us. Because you asked for it, more from Fr. Christopher Hartley. Shrine of Our Lady of Good Help, a place of pilgrimage, hope and healing. New Year, New Building Name, Radio Registration Drive, plus Jesus and Our Resolutions.